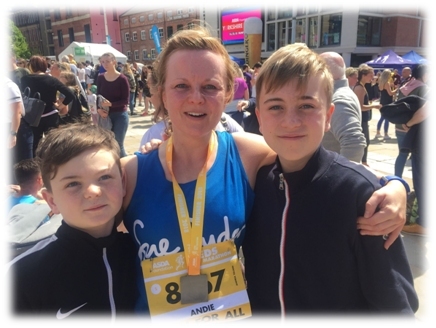 Andrea Toland of Leeds, England completed her first half marathon May 13, 2018 representing the Wheatfields Hospice in the Leeds Half Marathon. She was sponsored with donations for the Wheatfields Hospice where she is a nurse. Andrea is not a regular distance runner; the farthest she formerly ran was about 6 miles 7 years ago. Andrea is the daughter of Anthony and Karen (Swire) Toland of Blackpool, England; the granddaughter Catherine (Murray), of Derrykenny, County Fermanagh Northern Ireland and James Toland; the great-granddaughter Mary Tinneny of Goladuff and her husband Patrick Murray of Derrykenny and the great-great-great-granddaughter of Mary Tinneny of Goladuff.